When I was in Kikima with my family in the summer of 2008 we stayed with Ruth and Henry and I ‘befriended’ a goat – I called him Geoffrey. He was a nice goat. Then he became more than just a nice goat – he became the main course in a celebration for 150 people to mark our partnership in forming The Creation of Hope. Out of solidarity with Geoffrey I didn’t eat the main course. Now, two of my friends, Amy and Tori, have given me a goat for my 17th birthday. This goat, to be purchased soon will be called Geoffrey Junior, and will become the billy goat for a whole lot of nanny goats at the orphanage – this is a project my father has called The Goat Academy. The plan is for goats to be raised on the site of our children’s residence, they will be cared for by our children, the milk will go to them, and newborn babies will be given out to needy children in the community – after they’ve come and learned about goats and helped to care. Yeah Geoffrey – you’re going to be the father of all those goats! And thanks Amy and Tori! 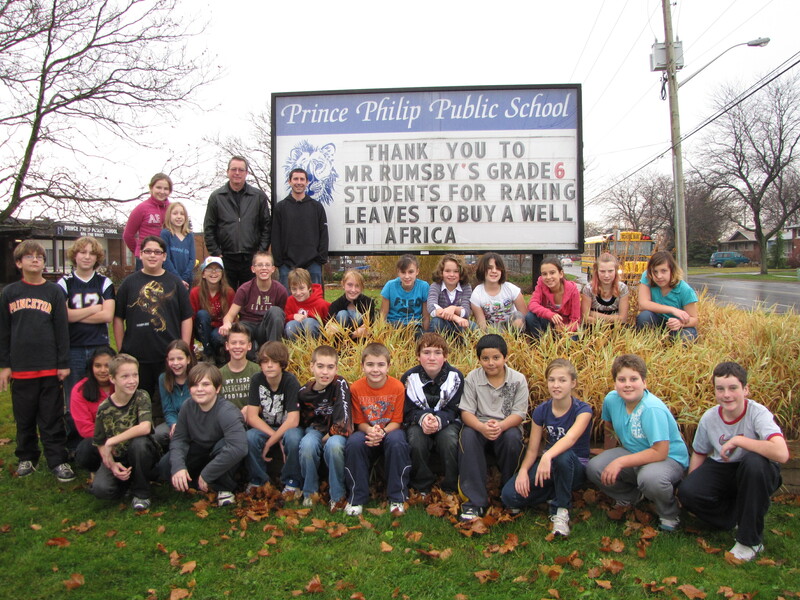 Last month we mentioned that a school in St. Catharines – Prince Philip under the direction of Ryan Rumsby – was working toward paying for one of the water projects that were being done in Kikima. 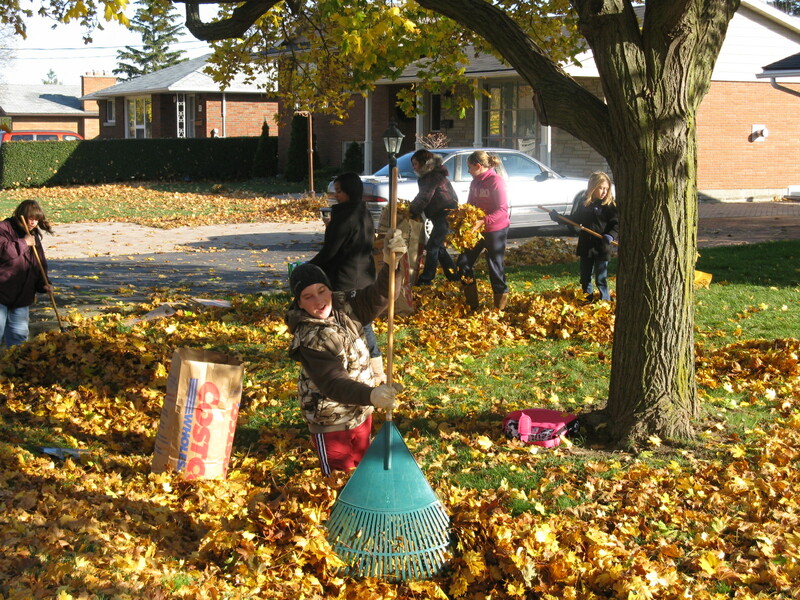 The kids in his class gave up time after school and on weekends to rake leaves. And instead went above and beyond their goal – raising $772.36 – which included $50.00 from Rachel who donated her birthday money! My father was in St. Catharines and met with the class to receive the money (my father is tall guy in the back row) and to share with them the photos of the finished water project. I am happy to see the amount of work that the students have undertaken to help provide water for 70 households (approximately 700 individuals). 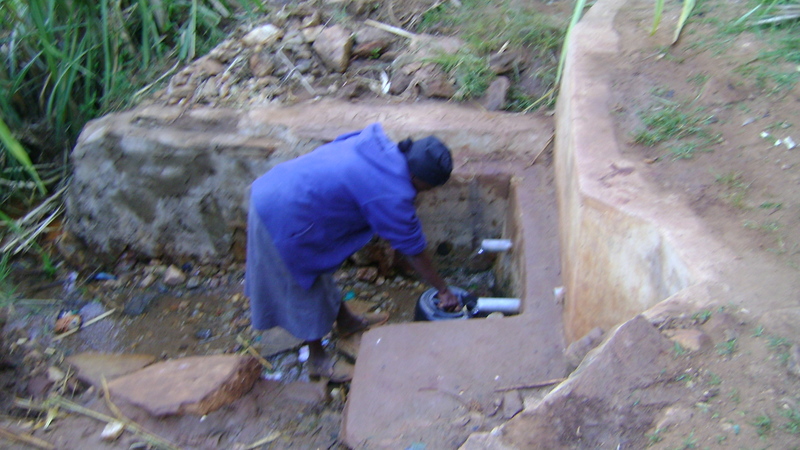 The beneficiaries reside in Uma village and had been drawing the water with dirty containers. These pipes were sunk down to a natural source of water that was slowing trickling to the surface, but gathering in a small dirty puddle. 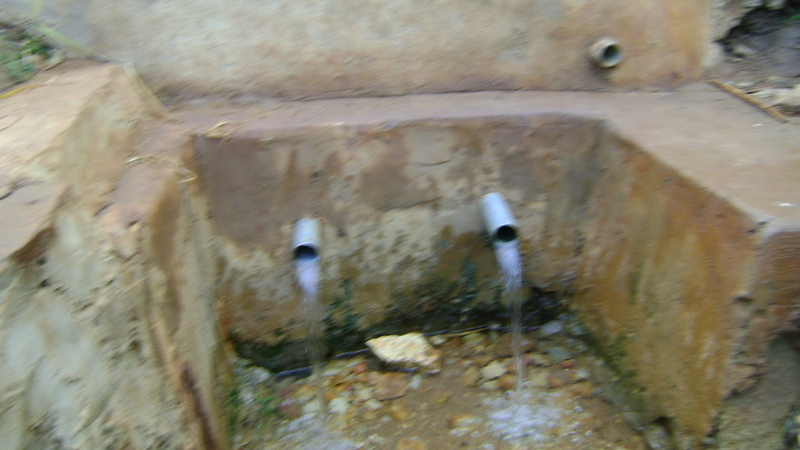 The pipes were dug down and tapped the spring, allowing water to flow up to the surface, to be clean, and to be gathered either through the pipes or from the concrete pad at the bottom. Before most often people would fall sick with malaria, typhoid and even brucella. With this new supply, the beneficiaries will save money, will have more and cleaner water to drink and for their crops, and be stronger as they go about their daily work. This water will save lives. Your students weren’t just raking leaves, they were saving lives! The final cost of this project was $340.00 – which was more than $60.00 under budget! Mr. Rumsby went to his class and discussed options for what they’d like the rest of the money spent on. They decided that it would go for the Goat Academy. With those funds we will now start construction and by the end of December there will be pictures of the completed structure and the first goats will be there! Mr. Rumsby said that this is just the beginning for his students and they will do other things throughout the year to raise money. Way to go! While my father was in St. Catherines he also presented at Sheridan Park Public School. They made a donation of $200.00 and this money has been dedicated to sapling planting. The money from Sheridan has resulted in 869 saplings being planted! Sheridan Park Public School in St. Catharines is a kindergarten through grade 8 school that prides itself on being Eco-friendly, achieving Eco-gold status two years in a row. For every 100 books our students read, a tree is planted in our school yard. The staff and students at Sheridan Park chose to donate saplings in the hopes of making a difference somewhere other than their own backyard. Our friends at William Dunbar, under the leadership of Susan Wright held a teacher baby photo contest. Students paid for a ballot to guess who was who among the 30 teachers who participated. Three students managed to identify 28 out of 30 teachers! They received a special pizza lunch! Both their present principal, Wendy Holmes and the retired principal John Howard made an extra donation for each photograph that was identified. They raised $359.00 for The Creation of Hope and the students got to see proof that their teachers were not only babies at one time, but they now know who were the cutest babies! In the spring of 2009, Eric Walters came to Bath Public School to give a presentation to the students. His presentation reflected his passion for helping children and families in Africa. After the presentations the grade seven class was inspired to make a difference for those families in Africa. A few girls, Alex Tassielli, Caitlyn Poudrier, Jong Ae Park, Katie Denyes, and Michaela Dominik, decided to organize a penny drive to raise money for his charity, The Creation of Hope. We encouraged students to bring in pennies, and other coins to donate. After a week of collecting money, we were anxious to start counting. After many weeks of counting, it was time for the final amount to be revealed. In total, we raised an astonishing $781.10. We were all very proud of how we made a difference and to think, it all started with a penny! We are in the middle of another water project – this one bigger and able to provide water for 1400 people. We’re going to put the money from both Bath Public School and William Dunbar toward this project. We hope we can have the project finished before the end of December and pictures posted on the site by the next update. My father visited at Terry Fox Public School in Barrie, Ontario. He said how incredibly impressed he was with the way the staff and students want to get involved in raising funds. 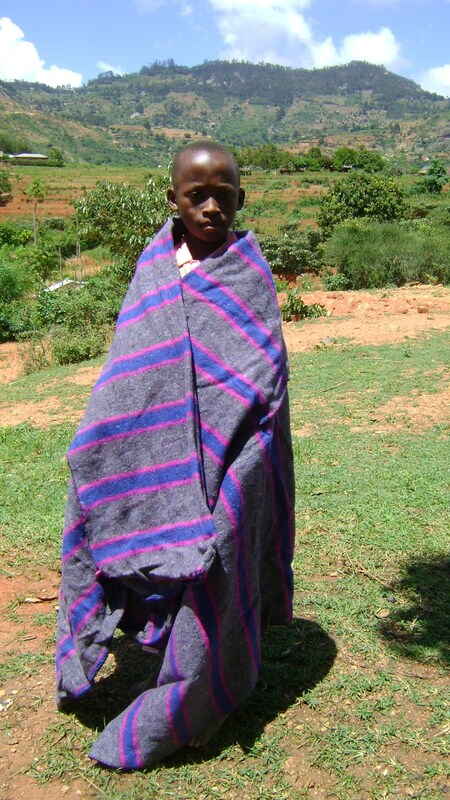 He was really impressed when one student, Mark, came forward and gave him $5.00 so that a child in Kenya could have a blanket. It’s students like Mark who don’t just listen, but act, that makes all of this possible. Thanks Mark! Nthenya was born in 1996 and is 12 years old. Unfortunately, her exact date of birth is not known. She lives with her elderly grandparents and two other siblings. Her grandparents do not have a regular income from employment, but rather earn a merge income from doing casual labour where they can. Nthenya shares a bed with her two siblings and her wish list includes clothes, shoes, school textbooks, stationery and a school bag. She is a promising girl in school and we believe her potential can be enhanced by bettering her situation, which you have chosen to. Thank you again! She is currently in standard (grade) 5, and will be proceeding to standard 6 in January 2010. Dulce and her family are the new sponsors of Nthenya – our great thanks! 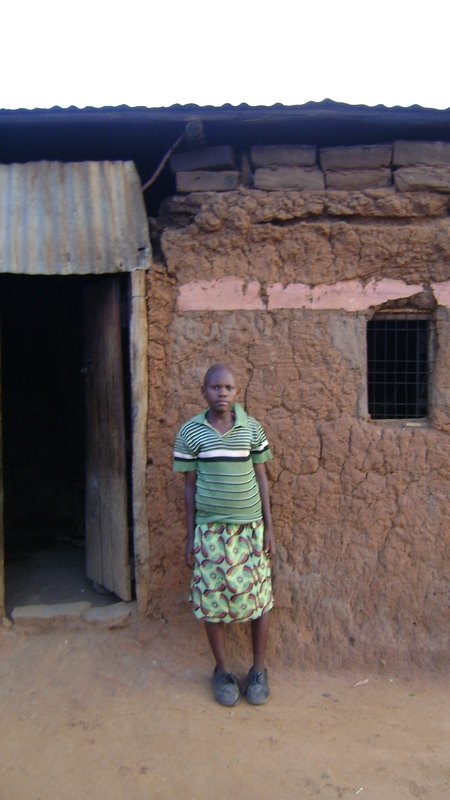 Below is Mercy Ndanu and she is living with her two older brothers, their old grandmother having died. Her sponsors are the Vivians. Ruth is discussing with her family whether she should be admitted at Hope due to the condition of her abode and the need for more supervision. 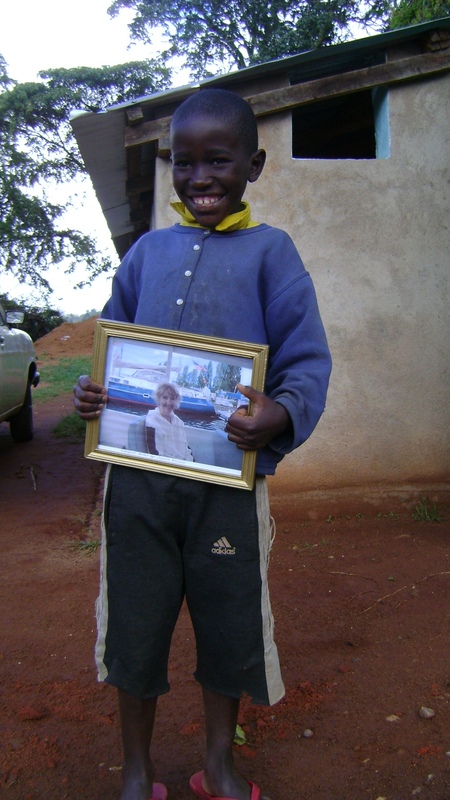 Here’s Charles with the picture of his sponsor, Margaret. Charles finished first in his class in the latest series of tests. His teacher was so pleased that he gave Charles 100 ksh from his own pocket! 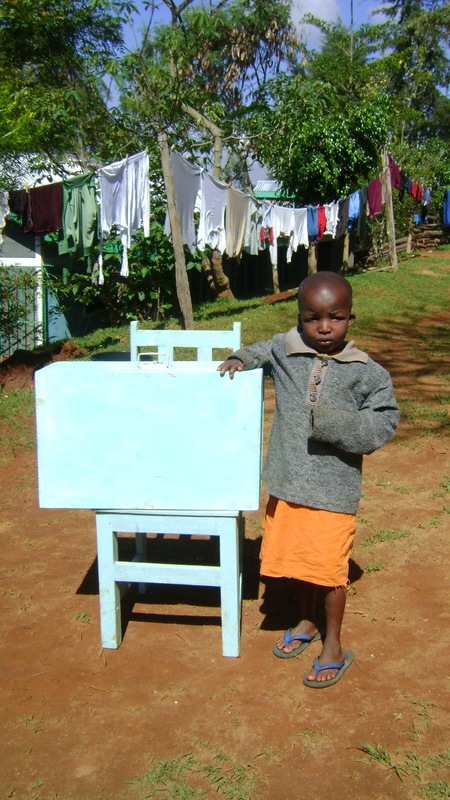 We also have three more people who have requested to become involved and sponsor children. They’ll be connected in the next week or so – in time for Christmas – but the posting won’t happen until early January. 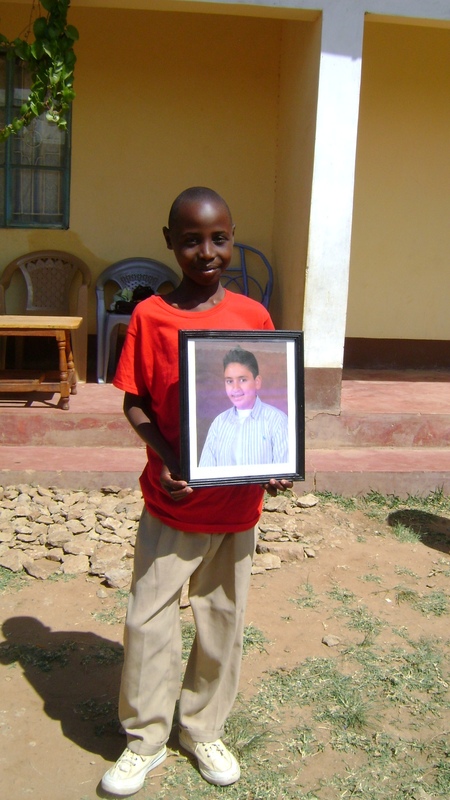 Here’s a shot of Mwongela at Exodus Children’s Home, holding a picture of his sponsor Bilaal. Mwongela is very, very bright – the top student in his school in Grade 4 – and Bilaal is probably going to be the Prime Minister of Canada some day so maybe they’ll end up meeting at a UN conference when one is in charge of Canada and the other in charge of Kenya. Bilaal might be going over in March to meet his sponsored child. 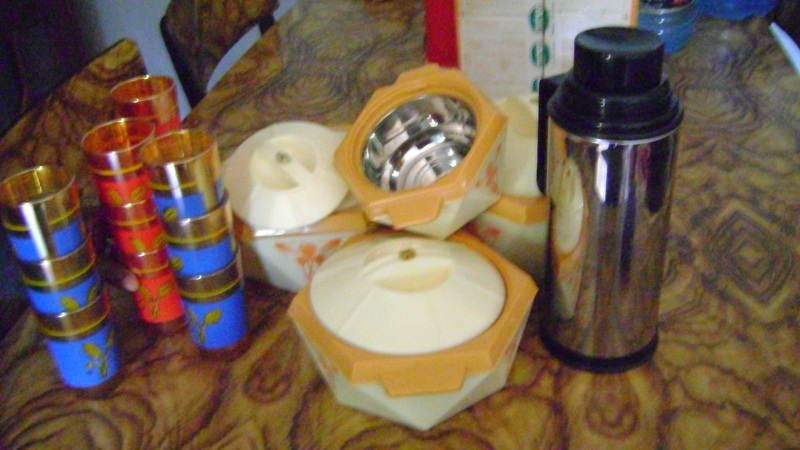 When Ruth and Henry returned to Kenya they brought with them presents that had been sent by kids here. Here are a couple of photographs. These are from Rolling Hills Public School for ‘their children’ at Rolling Hills Residence. Part of gigantic bag they send back that contained lots of things including school supplies and stuffed animals. 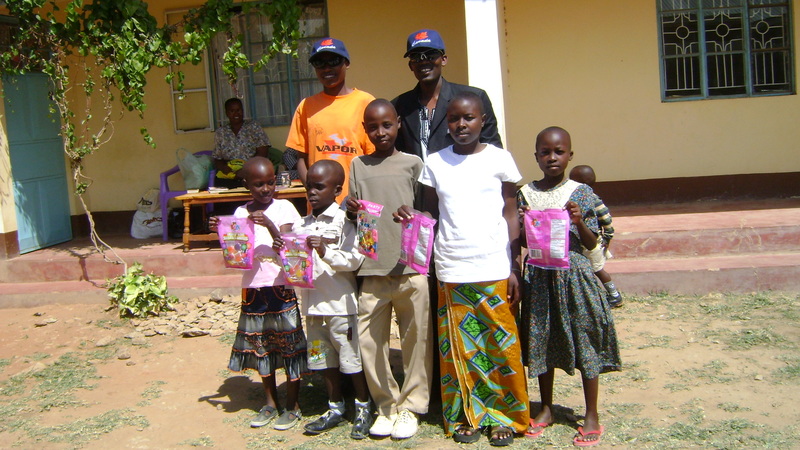 Here is Elijah and Mutuku wearing sunglasses and Canada hats sent to them by Mollie and her family, along with special treats supplies for all the kids at Exodus. Just an update on Mutuku. He has just been named the ‘head boy’ at his school. This is a great honour and shows how he is seen as being responsible. I’m not sure who’s prouder of him, Elijah, Mollie or my father! 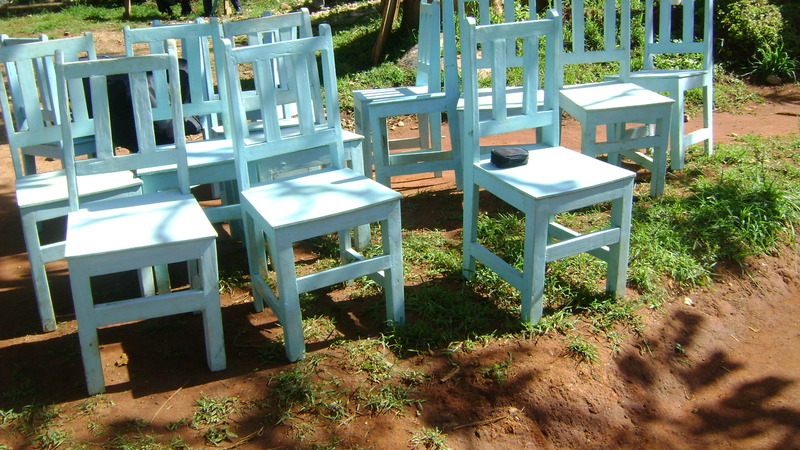 The chairs and personal storage boxes for Rolling Hills Residence children were made at the local polytech. By doing this the polytech carpentry students were provided with wood to use for their training while being given money that they use for their tuition. These were paid for by Ray Lewis Public School’s penny drive last year. 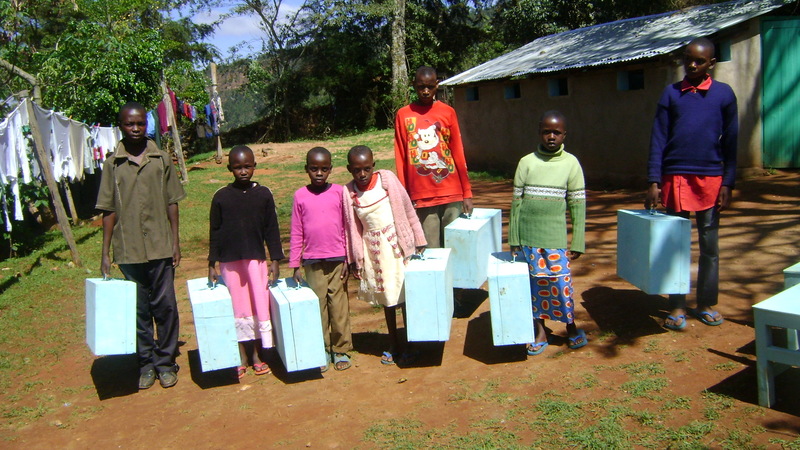 Some of the children with their storage boxes – a way to have their own private space! 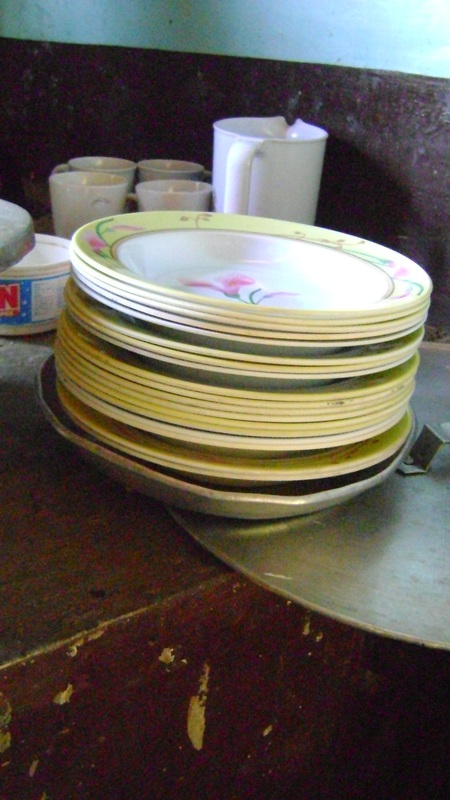 Sir Samuel Steele donated money and part of this money was used to buy all the utensils, plates, cups and pots for The Rolling Hills Residence. Here are a couple of shots of them. Thanks Sammy Steele Students! 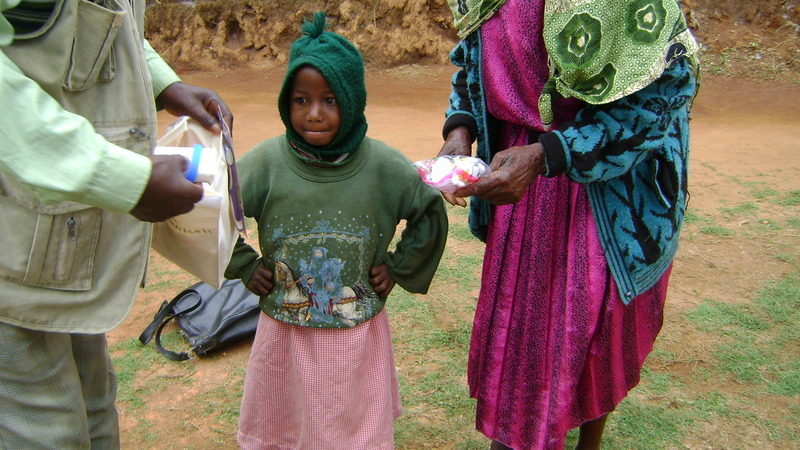 When Ruth and Henry went back they brought with them soup mixes – each package could provide 100 cups of soup. 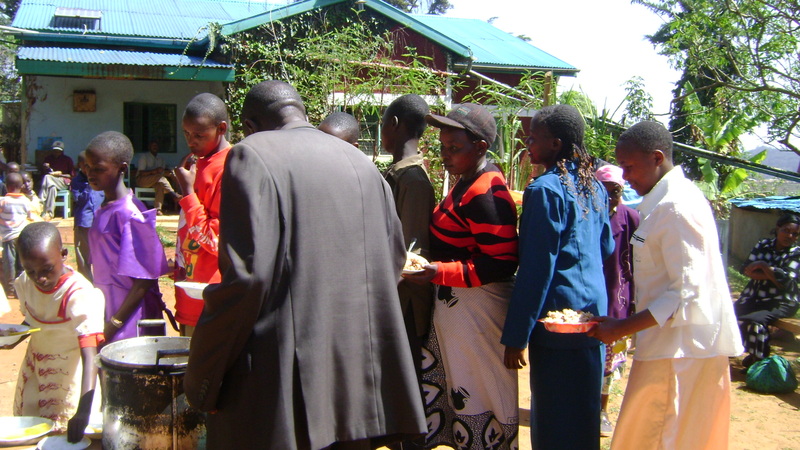 Soup was provided for all the orphans and extended family members at the last food distribution. Ruth says that the soup was very tasty and loved by everybody! Thank you Ontario Christian Gleaners and for Colleen Stinson for making the connection! Because of them, 100 people had a bowl of soup last month to feed their bodies and warm their souls! This will be a staple during these food distributions for the months to come! 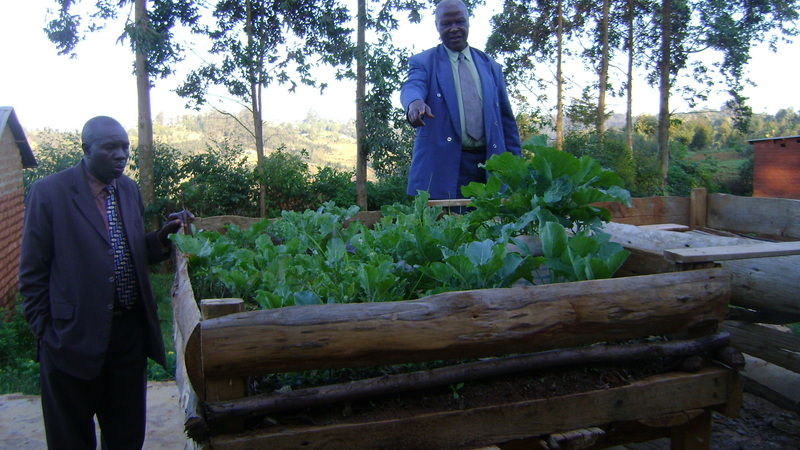 Some donated money was used to build a vegetable garden at a local church with the produce being donated to poor members of the community. We have lots of things happening – three literacy days (two in Toronto on February 18 and 19th and one in Durham on May 26), and an evening event in Burlington on March 26, and dozens and dozens of schools raising money right now. This includes people from across Ontario, in Manitoba, Saskatchewan, Alberta, B.C. and in the Maritimes. Below is a letter to my father from Mike Berg in Saskatchewan who has got many school in his district, Prairie Valley, working to raise funds. Sorry it has taken so long to email you but as you know life is busy and we are literally swept up in it at times. Anyways I would like to update you on how things are going. First off all I did a presentation to our school, the school council and the community of Cupar and everyone is thrilled to be on board. Our local MLA Glen Hart was in attendance and even brought the program up during the throne speech at the legislative buildings (Which i taped). Also Fort Qu’appelle Times (Local paper) is doing a story about Cupar and the program that will be coming out this week sometime. I would like to say that I have used the Creation of Hope project to get my grade 8 class and the school more involved, active, and aware about the world. In Cupar school be have a value matrix that we try to build, which is honesty, respect, responsibility and leadership and this program helps students develop and grow.